I have recently interviewed not one but two restaurateurs who put barbecue on their pizza. I do a monthly feature for the Greenfield (Massachusetts) Recorder called Blue Plate Special, in which I interview the chef at a local restaurant and ask him or her for a signature recipe. Last month Lou Ekus of Holy Smokes BBQ Delicatessen in Turners Falls gave me recipes for Tuscan white beans and pickled onions (coming soon to a blog near you!). 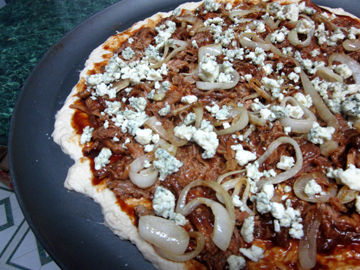 Lou also mentioned a dish he makes frequently, one I knew would appeal to my family (who happened to be coming to dinner the evening after I talked to him): pulled-pork pizza. This month I talked to Craig White of Hillside Pizza, who along with partners runs pizza restaurants in three western Massachusetts towns. He described his mouthwatering chicken barbecue pizza. Both of these men are passionate about good food so I figured they must be onto a good thing! I will try Craig’s pizza when I return home to Massachusetts. It uses an almond Asiago pesto only available at his establishments. Meanwhile, here is my recreation of Lou’s pizza. I’m sure it’s amazing made with his signature barbecue sauce and pulled pork. (The man is a serious smoker!) I’m afraid I just purchased barbecue sauce and pulled pork at Trader Joe’s. Even with those ingredients, the pizza worked. I love salt so for me the combination of barbecue and blue cheese was a real winner! I should warn you that my nephew Michael didn’t take to the blue cheese in this recipe. He believes blue cheese belongs only in salads. (We’re working on his culinary education!) So I have listed cheddar as an alternative. Bring the pizza dough to room temperature and preheat the oven as indicated in your dough instructions. Sauté the onion slices in a little butter, starting with high heat and then reducing it to low. Stir occasionally and cook for 25 to 30 minutes, until the onions have caramelized. Roll and/or stretch the pizza dough out gently (this may take a few tries) so that it forms a 14-inch circle (or a rectangle to go onto a cookie sheet if you don’t have a pizza pan). Use a little flour to help with this if necessary. Spray your pan lightly with cooking spray and oil it even more lightly. Place the dough on the pan. Spread a very thin film of olive oil on top. 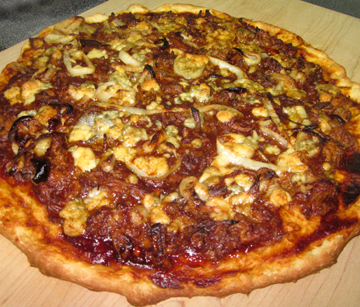 Spread the barbecue sauce on top of the crust, and sprinkle the pieces of pork around evenly on top of that. Arrange the caramelized onion slices over all, and top with little chunks of cheese. Bake the pizza until the cheese is nicely melted and the bottom of the crust turns golden brown. With my crust (from Trader Joe’s) and my oven this took about 20 minutes. This entry was posted on Friday, April 20th, 2012 at 4:00 am	and is filed under Pasta and Pizza. You can follow any responses to this entry through the RSS 2.0 feed. You can leave a response, or trackback from your own site. My favourite take-away establishment does wonderful pizzas, with all sorts of toppings. I especially like the hot and spicy ones – lots of chili and jalapenos! !